Turn your outdated bathroom into a luxurious retreat with the latest styles in bathroom vanities and cabinets for your bathroom renovation. Winnipeg Cowry Cabinets LTD offer a variety of bathroom cabinets and vanities to fit all kinds of design styles. With affordable prices, fast delivery and high-quality products, Winnipeg Cowry Cabinets LTD is the premiere Winnipeg bathroom cabinets company. Whether you’re a homeowner working on your own home or a developer building a new property, we offer a selection of styles for bathroom cabinets in Winnipeg. With so many bathroom vanities and cabinets dealers, why should you choose Winnipeg Cowry Cabinets LTD? First, we provide high-quality products at affordable prices. Our bathroom cabinets are made of solid wood to be long-lasting, and they come with a lifetime warranty on the fixtures. They are finished both inside and out, which means they are ready to install once they arrive. The second reason to consider Winnipeg Cowry Cabinets LTD when you’re searching for bathroom vanities in Winnipeg is because we provide one-week shipping. From the time you place your order, it takes only 5-7 business days for the product to arrive. We can offer this fast service because we have a large warehouse in Greater Vancouver. Once we receive your order, we start the process immediately. With less of a wait time, you can complete your project faster and on-time. If that’s not reason enough to choose Winnipeg Cowry Cabinets LTD, we also provide exceptional customer service every step of the way. From the initial measurements to choosing the design to delivery and installation, you can rely on us to help you complete your bathroom with less worry and fewer delays. We provide instructions for installation of our Winnipeg bathroom cabinets. If you don’t have time to do the job, we also offer professional installation. We at Winnipeg Cowry Cabinets LTD understand that our customers only want the best of the best. We strive to offer what is right for you. When you order with us, you will be assured of the best quality of bathroom vanities in Winnipeg. So why choose our wooden vanities and cabinets over other materials? Let us explain. Solid wood is a lot stronger than particle and MDF boards. Unlike solid wood, other materials need care and maintenance. They can even swell if they come in contact with water and that’s the thing that you won’t have to worry about with our custom-made, solid wood vanities. MDF and particle board cabinets are also prone to bending and sagging easily. Trust us; you don’t want your expensive countertop to be placed on a piece of particle board. The best part about solid wood vanities is how beautiful they look. They will last for generations to come and never get out of style. You can always re-stain them for a new look. If you are convinced on wood for your next set of vanities, then contact us now for the best deal on bathroom vanities in Winnipeg. We provide exceptional quality service with quick and efficient customer service. We provide a large selection of styles from traditional to contemporary. Whether you’re looking for dark wood tones to add a sense of warmth or light shades to brighten a small space, we have what you need. Winnipeg Cowry Cabinets LTD works with homeowners, builders, interior designers and more to help you create a remarkable bathroom that will appeal to all who see it. In addition to the cabinets, you can rely on us for your countertops and fixtures as well. By purchasing everything through Winnipeg Cowry Cabinets LTD, you ensure that colours and styles match and the pieces fit correctly with no need for alterations. In addition, it saves you time from going to multiple stores. We provide these items below retail prices, which saves money for the overall project. 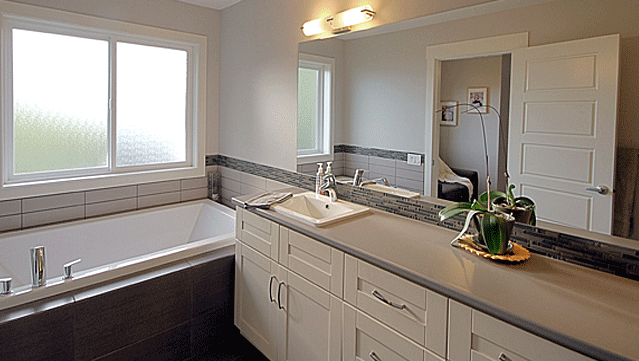 Build or rebuild your bathroom with cabinets and vanities from Winnipeg Cowry Cabinets LTD. Create a room you’re proud of that will last for a long time and please your family or client. Contact us today to help you begin the process of selecting bathroom cabinets that fit with your space, design plans and budget. Winnipeg Cowry Cabinets LTD makes it easy to have the bathroom of your dreams at an affordable price.